The Art of the Doll in all its Creation is coming on June 19-23, 2019. Experience the magic as if you were there - and watch it again and again! 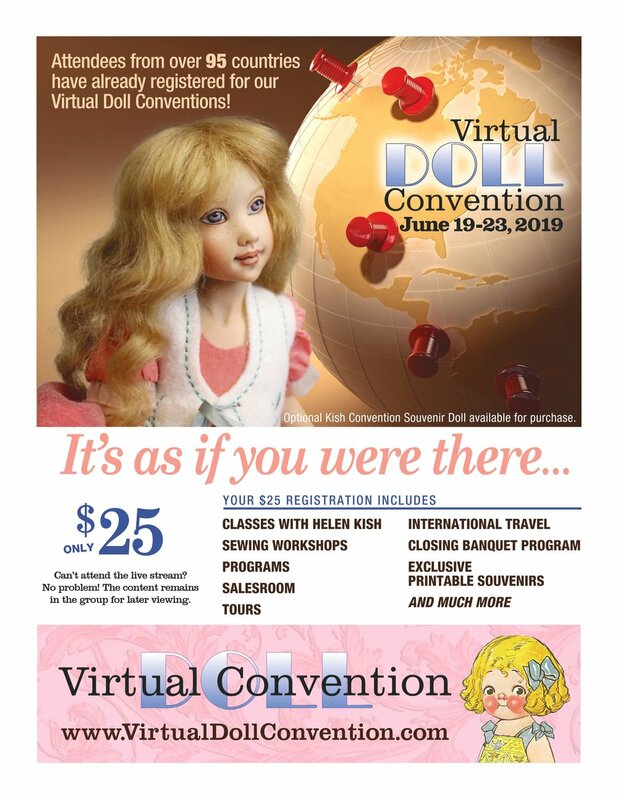 Virtual Doll Convention is a completely interactive Doll & Bear Convention that is presented entirely online in a private facebook group. The Art of the Doll Virtual Convention that is run entirely online in a private Facebook Group. You will experience ALL that you typically experience with an on-site Convention for the cost of only $25.00. Read below for everything that is in the works for the upcoming June ‘Art of the Doll’ Virtual Doll Convention. This Convention is presented 100% online in a private group on Facebook. Join Doll and Teddy bear Enthusiast, Collecting Influencer, and Virtual Event Entrepreneur, Rachel Hoffman as she guides you and a group of like-minded individuals through The Art of the Doll in all its Creation on June 19-23, 2019. All of the scheduled events will remain in the group for later viewing for those who can’t catch it live or want to watch it again. The content is created and streamed special for this convention. We hope you join us! All this for $25.00?! SAY NO MORE and SIGN ME UP! By joining this exclusive Convention group, you will receive all this below (and more) for only $25.00. We’ll have daily conversation starters and check-ins as well as an open forum for you to connect with others who are attending the convention. Conventioneers will be encouraged to share their personal collections, and enjoy lots of ‘look and learn’ moments from each other. Prior to the start of the convention, you will receive all of your resources and schedules to follow along. Can’t attend at time of live stream? No problem! The content remains in the group for later viewing. One of the most sought-after and respected doll artists working today, Helen Kish has created a rich repertoire of work ranging from charming limited-edition vinyl and porcelain dolls to evocative one-of-a-kind sculptures of clay, porcelain, bronze and stoneware. Helen Kish will be offering an optional souvenir doll plus TEACHING a painting and sculpting class for the first time in her dollmaking career. This is groundbreaking for artists and collectors of all kinds to experience her talent in action and learn from one of the greatest doll artists of our time. Little Ladies: Victorian Fashion Dolls and the Feminine Ideal - Before Barbie and American Girl, there was Miss Fanchon. The ultimate toy for privileged girls in the 1860s and 1870s, she and her friends were seen as models of ladylike perfection. These dolls came with an amazing array of dresses, undergarments, and meticulously crafted accessories, from gloves and jewelry to roller skates and calling cards. The trip to Philadelphia and special program production is underwritten by a generous grant from Virtual Convention Sponsor Billye B. Harris of Ashley’s Dolls. We will visit the birth house of Margarete Steiff, the founder of Margarete Steiff GmbH - or the Steiff Company as we better know it. The house is located just a stone's throw from the factory in Giengen, Germany and is open to the public. It can be explored with a docent or via a self guided tour - or in this case - at the Virtual Convention. This tour and production is underwritten by a generous grant from Virtual Convention Sponsor ‘Steiffgal’ Rebekah Kaufman. Seminars: Tune in for exciting programs where a world-renowned expert or teacher in their field will interact with you. You will be able to ask questions, interact, and view the seminars at a later date if your schedule doesn't permit for live viewing. These programs will include lots of dolls and bears shown in real-time. The workshops will feel so real; you will want to reach out and touch your screen! Shelley Thornton - Textile talk, special exhibit, celebrated doll artisan. Bradley Justice Yarbrough - Barbie + his other magical offerings for us! Billye Harris - The Pink Princess never disappoints! Rebekah Kaufman - Steiff Bonanza in the works + museum tour. John Port - Teddy Bear artist and expert. Stephanie Blythe - NIADA artist, dyeing fabrics workshop. + More exciting topics and speakers in the works! “The character of my design for dolls has naturally evolved out of my illustration style, which is decorative, clear and simplified, with heavy outlines and solid, carefully orchestrated colors. Consequently, my dolls are relatively simple or stylized, and not overly embellished. Their visual interest relies largely upon the juxtaposition of the found patterns and colors of the fabrics. Most importantly, I strive for each doll to express an individual "presence." I was born, raised and educated in Lincoln, Nebraska. From the age of two, my major focus was art. Drawing, painting, and constructing things occupied most of my childhood. I have always been interested in sewing, dollmaking, toys, puppets, and animation. 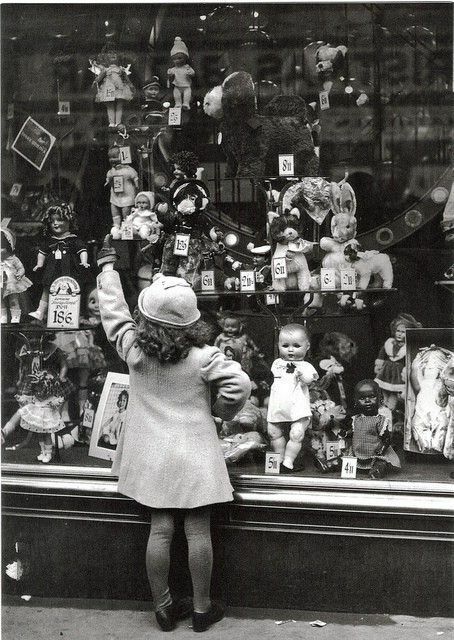 "...we can see at once that these dolls are superbly designed and made, with technical competence bordering on bravura. They stand before us, these curiously romantic creatures, complete and perfect and disarmingly simple and I am immediately enchanted and swept away on a wave of pleasure..."
Workshops: It's never too early or too late in your doll collecting journey to learn tips and tricks for doll care and preservation. In the virtual workshops, you will receive your supply lists the week before so you can work with the instructor in real-time. The supplies will be easy and inexpensive to find/purchase, and you might already have them. THE OPTIONAL SEWING KIT FOR THE WORKSHOPS WILL BE AVAILABLE SOON. These workshops are ALL SKILL LEVEL. CHECK BACK FOR THE FINALIZED SEWING COURSES - WE ARE ADDING THE FINISHING TOUCHES! 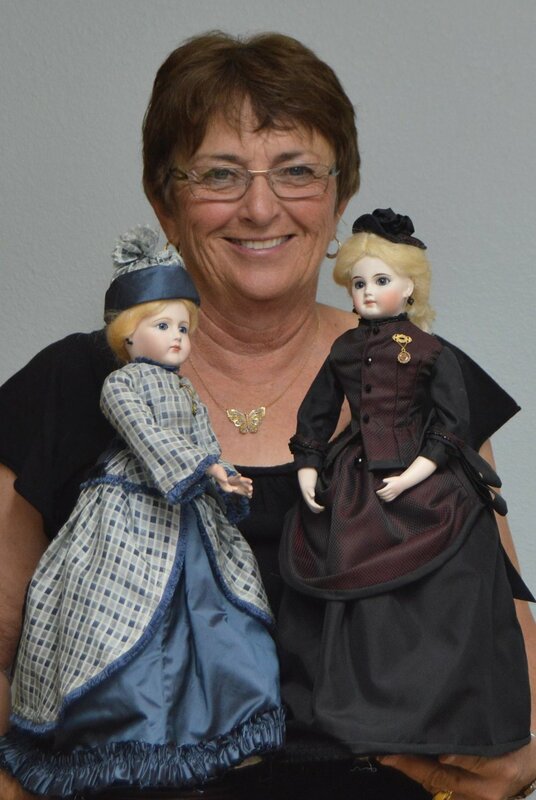 Learn more about Linda’s dollmaking practice. G.day, Mate! Travel Down Under to South Australia for The South Australian Doll Guild Convention: Through the Looking Glass. You will experience the sights and sounds of this fabulous place + experience the creativity of the South Australian Doll Guild. We will peek into the workshops, presentations, and special exhibits at this International Event. Your hosts are Michael Canadas, David Robinson, and Rachel Hoffman - and we can't wait to take this adventure with you. If you want to meet us LIVE in Australia in April 2019, register here. On Friday, we will open the virtual doll and teddy bear salesroom! Shop hundreds of items in a pop-up 72 hour virtual sale filled with exciting finds in every price range. Shop from hand-selected vendors across the country who will be picking highlights from their inventories special for this event. Each seller will have their own album in the group, and you can shop each virtual booth with ease. Movie Screening: Popular Classic - On Friday night after a busy day of shopping, we will unwind in the group with a classic movie screening. The group will take a poll and decide on the film at the beginning of the day. 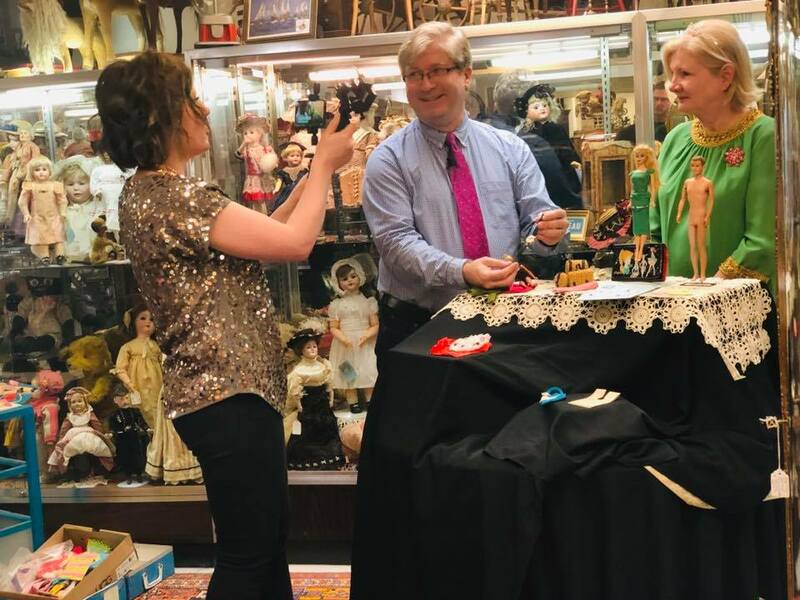 Michael Canadas and David Robinson of the Carmel Doll Shop and The Grovian Doll Museum have put together an epic program on George Stuart. For more than fifty years NIADA artist George S. Stuart has been capturing the essence of history's most famous and infamous personalities. He creates captivating portraits of famous and infamous people of world history who wielded influence and power in their time. His works have been exhibited in The Smithsonian and William J. Clinton Presidential Library as well as at other museums and libraries throughout the United States. Chef David Robinson WOW’d us in January, and he is already preparing a special menu for the June Art of the Doll Convention. You’ll receive the ingredients list, digital cookbook AND specially designed menu and place-cards prior to the start of the Convention. On Sunday prepare to cook along with David and Kay Morton, right in Michael and David’s Home Kitchen. We will have our own Sunday Evening Banquet; feel free to dress up before we chow down! We will then enjoy a showing of the closing program by Michael and David on George Stuart which will be the grand finale to this exciting week. You will receive a daily souvenir consisting of beautiful printable paper dolls and bears! If you enjoyed the souvenirs for the January Virtual Convention, wait for what is in store this time! The souvenirs are made SPECIAL for the Convention by ARTISTS that you love. They include Helen Kish, Diane E. Vining, Kathy Turner, Shelley Thornton, and Stephanie Blythe. They will consist of clothing, backgrounds, and more. Just download and print! Thank you to our 2019 Art of the Doll convention sponsors - see below for our generous patron and business partners.